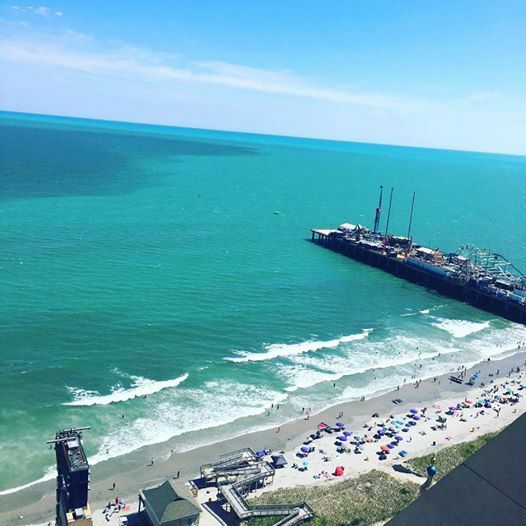 Turquoise-colored tropical water off of Atlantic City, with the skyline in the background. Tropical waters off of Atlantic City, with the Steel Pier in the foreground. The tropically colored water from Brigantine Cove, with Atlantic City in the background. Given adequate sunlight and nutrients, phytoplankton populations can explode into blooms large enough to be visible from space. On July 6, 2016, the Moderate Resolution Imaging Spectroradiometer (MODIS) on NASA’s Aqua satellite acquired this natural-color image of a large phytoplankton bloom off the coast of New Jersey. There’s definitely something in the ocean water that has South Jersey beachgoers all abuzz. No, it’s not a great white shark. It’s the crystal clear and tropically tinted ocean water, much different than the grayish color swimmers know along the Jersey Shore. An upwelling of cool ocean water earlier this month has led to a phytoplankton bloom off of the South Jersey coast, which turned the waters from Long Beach Island to Cape May to a Caribbean shade of aquamarine. The water was made even more clear by an ongoing drought across parts of the Northeast. 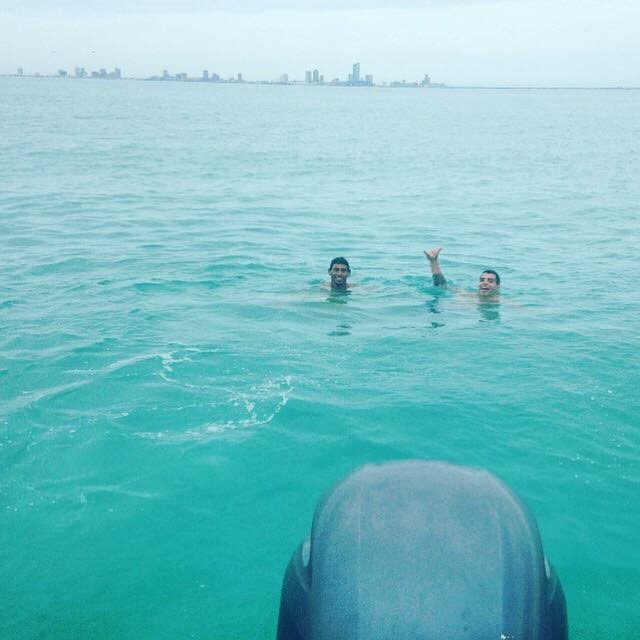 From a boat off Atlantic City, with two swimmers in the aquamarine colored water. 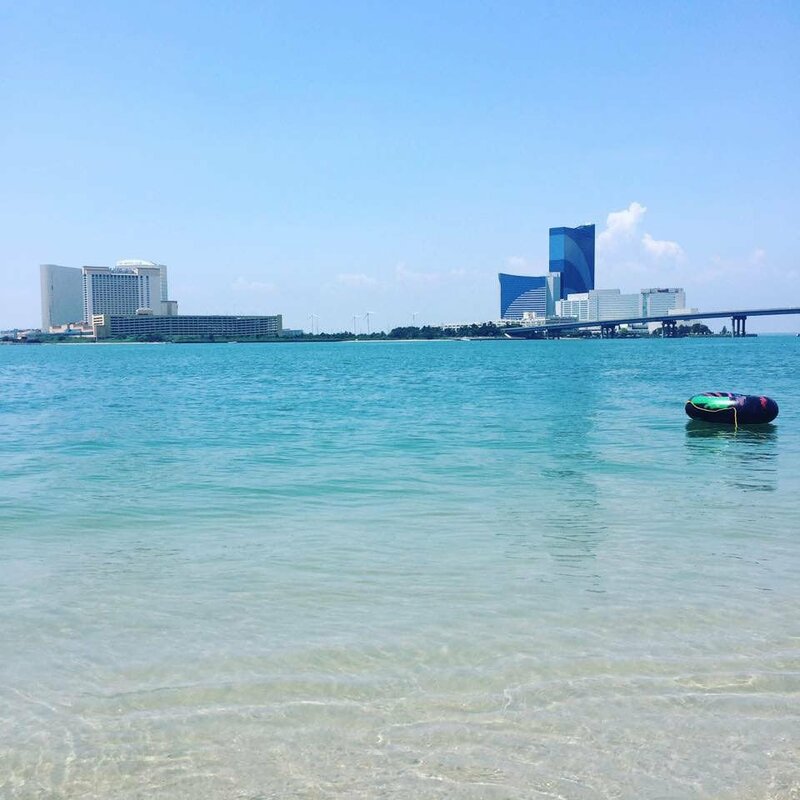 Jason Rouse with this picture of the turquoise ocean from Atlantic City, with the Taj Mahal and Steel Pier in the foreground. Picture of a shark from a scallop boat off of the New Jersey coast, in the clearer and greener than usual coastal waters this summer. Blue-green waters off of the South Jersey shore have surprised and delighter swimmers and beachgoers early this July. 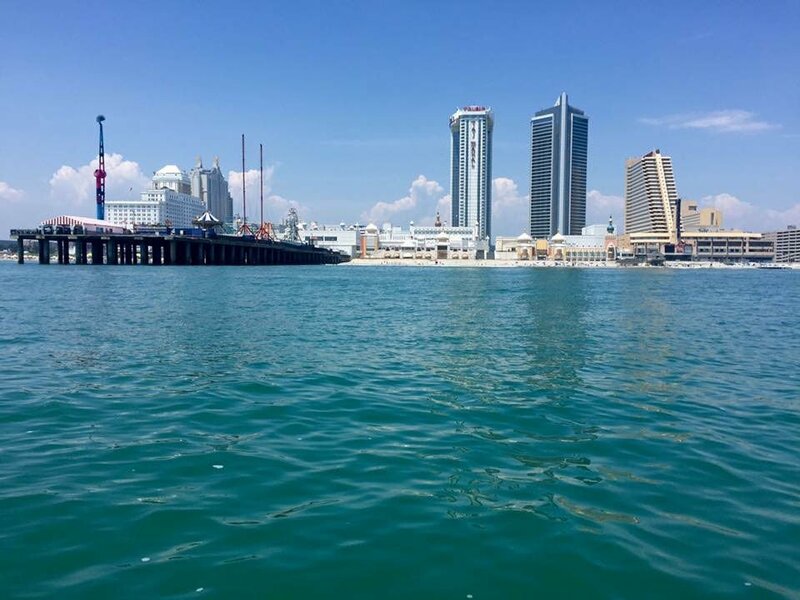 Captain Jeff George of Atlantic City Cruises says that dolphins are much easier to see in the tropically tinted, clearer ocean water off of South Jersey this summer. Picture taken at the Bell Buoy off the Longport Inlet, Sunday July 3rd. The color of the water was amazing. Jeff George, 47, owner of Atlantic City Cruises which operates out of Gardner’s Basin in Atlantic City, says the water color is all the talk of passengers this July. And it’s something he can’t stop talking about either. “I’ve been on the water my whole life, and I can’t remember water this clear and this green for this amount of time,” George said, who believes it’s been at least ten days and counting. On his dolphin watching excursions, George said his staff is inundated with questions from curious customers. “People are very impressed, and it makes a huge difference in spotting dolphins,” said George, who was excited that dolphins can now be more easily seen, from as much as several feet below the ocean surface. But what can’t be seen is the cause of the gossip-generating green water — phytoplankton. It’s the most popular topic Brian Devlin gets asked about through the summer. Elizabeth Lacey, assistant professor of marine science at Stockton University, said a phytoplankton population off the South Jersey coast has explosively grown last week, due to a process known as upwelling. “Phytoplankton are microscopic marine plants that blossom when the colder, nutrient-rich water comes to the surface from down below,” Lacey explained. Most are not visible to the naked eye and no larger than the dot of a pencil, Lacey said. But when upwelling fuels such a large bloom, the result is hard to miss. “Phytoplankton contain chlorophyll, and especially when exposed to sunlight, reflect the turquoise-green wavelengths through the water,” Lacey said. Billions of phytoplankton are the cause. Lacey said a coke can filled with ocean water from the bloom can contain as many as 500 thousand cells. But the effect, other than the water color, is minimal. “The bloom is harmless to people and actually an important part of the food cycle, forming the base of the ocean food web,” Lacey explained. Microscopic organisms explain the ocean color. But it’s a macroscale meteorological event that may be adding to the water clarity this summer. “River flows through the Northeast and Mid-Atlantic have been below to much below normal early this summer,” according to Bill Marosi, a hydrologist with the National Weather Service in State College, Pennsylvania. While South Jersey has been wet, especially over the past week, about two-thirds of the Northeast is either abnormally dry or in a moderate drought. “Rivers deposit fresh water sediment into the bays and oceans, and make the water murkier and less transparent,” said Bob Chant, a professor of marine sciences at Rutgers University. Due to the expanding drought across the Northeast, there has been less fresh water discharged into the near shore waters than usual. That could lead to an uptick in water clarity, according to Chant. Stewart Farrell, director of the Coastal Research Center at Stockton University, agrees. “Tropical water doesn’t have the river or bay runoff to make it brown or cloudy,” Farrell explained, adding that water clarity is simply a function of suspended or dissolved sediment in the water. The waters off South Jersey may look tropical, but that doesn’t necessarily mean the ocean will feel tropical. “The upwelling brought ocean temperatures near the coast down into the low 60s much of last week,” according to meteorologist Jim Eberwine. He also noted warmer than average water in the bays as well as farther offshore. The near-shore water has since warmed, with water temperatures now a more pleasant 70 to 75 degrees. So how long will the green water last? It’s all about the wind. “Any kind of wind event can change the color, and wind can also move the bloom” said Chant. Until then, a very small organism will continue to make a very big green splash along the summer. Soupy, steamy and stifling all sum up Thursday’s sultry summer weather. As the old meteorological musing says, it’s not the heat, it’s the humidity. For two weeks centered around the Fourth of July, tropically tinted turquoise-colored waters made for a green splash off South Jersey. What was that ominous-looking cloud over South Jersey? Severe thunderstorms, complete with heavy rains, strong and gusty winds, and even some hail swept through parts of South Jersey Saturday evening. CAPE MAY -- A city beach reopened to the public Wednesday after it was closed because of high bacteria from a sewage spill at a nearby hotel. A group out for the day on the water came across one the stranger sights the ocean has to offer on Saturday. First it was the look. Now it’s the feel. Here's what Press of Atlantic City readers read the most this past year. Here's what Press readers read the most in 2016.